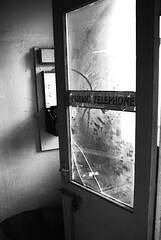 An old and empty phone booth lies neglected. Notice the lock and bolt on the door? I get the feeling this booth hasn't contained a phone in a long time..